There have been 20 official Perfect Games (sorry, Harvey Haddix; sorry, Pedro Martinez) in baseball history, and thanks to Dallas Braden and now Roy Halladay, there have been two of them in just twenty days. Of course it’s more preposterous than that. Because Mark Buehrle threw his perfecto for the White Sox just last July 23rd, there have now been three perfect games (15 percent of all of them, ever) in the last 130 days of Major League Baseball play. Wait – it gets worse. 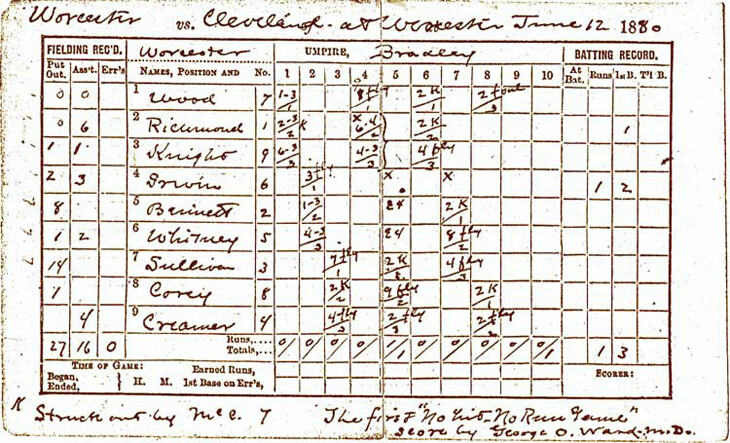 The first perfect game, by Lee Richmond of Worcester of the National League, was thrown on June 12, 1880. The second, by Johnny Ward of Providence (also still in the NL that season), took place just five days later. So now we’re talking about a quarter of all of them, ever, being concentrated in a net span of 135 days of play. Wait – it gets worse still. After Richmond and Ward set the standard for pitching perfection in less than a week, the next perfect game thrown in their league, was a mere 84 years and four days after Ward’s, on June 21, 1964. That was Jim Bunning’s 27-for-27 against the Mets, which, to round it out neatly, was the last such game thrown by a Philadelphia Phillies’ pitcher until Halladay did it tonight in Miami. And yes, therein lies the last bizarre coincidence. Halladay’s victim: Florida. Braden’s, three weeks ago? Tampa Bay. Buehrle’s, last year? Tampa Bay. Those three perfect games in the 130-day span were each against the two Florida teams. Baseball got lucky again; David Huff of the Indians was sending out his own health updates on Twitter, and actually back in the ballpark with his teammates before they finished their rally against the Yankees. But the luck can’t last forever: at the current rate of growth of bat speed, a pitcher will be maimed or killed before the decade is out, and the sport must take any action that will even slightly reduce the chance or delay the possibility. The easiest solution has been mentioned here before: since at the end of their deliveries, pitchers are closer to batters, than batters were when the pitchers released the ball, pitchers and batters alike should be wearing helmets. Period. As to the Kendry Morales disaster, this too has been coming for awhile (ask Jake Peavy about it, or Denny Hocking). You are not excluded from the laws of physics just because you’re happy and celebrating. Presumably this needs no new rules, just players seeing the videotape. Having just watched John Axford (right) record his second career save with a 1-2-3 inning against the Mets, I’m beginning to wonder if half of closing is style. Axford’s story is well-known now: Notre Dame, Tommy John surgery, transfer, independent ball, released, A-ball last season, and suddenly thrust into succeeding Trevor Hoffman in Milwaukee when his velocity jumped up to the mid-90’s this spring. 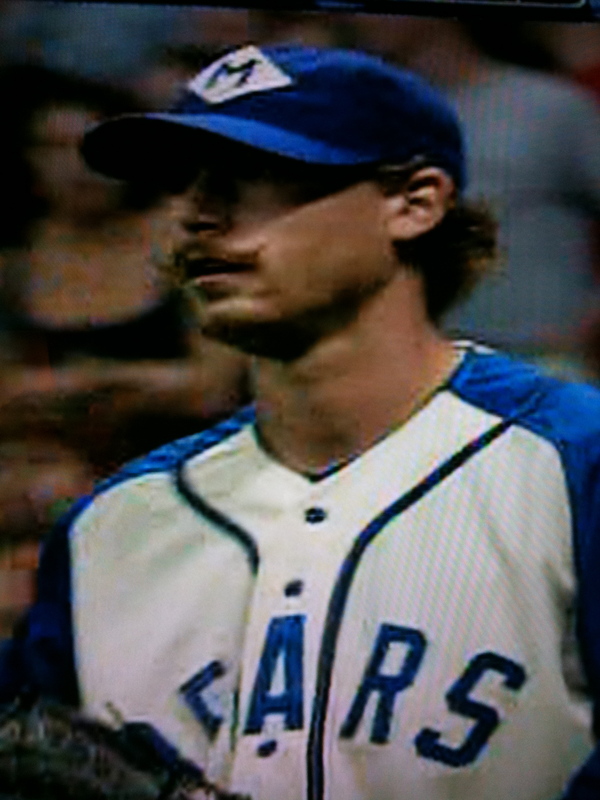 Plus he donned the Rollie Fingers style handlebar. The gentleman on the left you may not recognize, and if he had his way, this photo would never have seen the light of day. It is during his time in the Puerto Rican Winter League of 1972-73, at which point his career stats were 7-1, 4.28, 2 saves. Soon would come a Fu Manchu (and a grownup haircut), 309 more saves and eventually Cooperstown. That’s Rich Gossage, aged 21, and, no, the hair wasn’t attached to the cap. You’ll remember that after the contretemps with Alex Rodriguez, Braden had said “If my grandmother ran across the mound, she’d hear the same thing he (Rodriguez) heard.” After escaping the group hug with his teammates, with whom did he celebrate the perfect game? 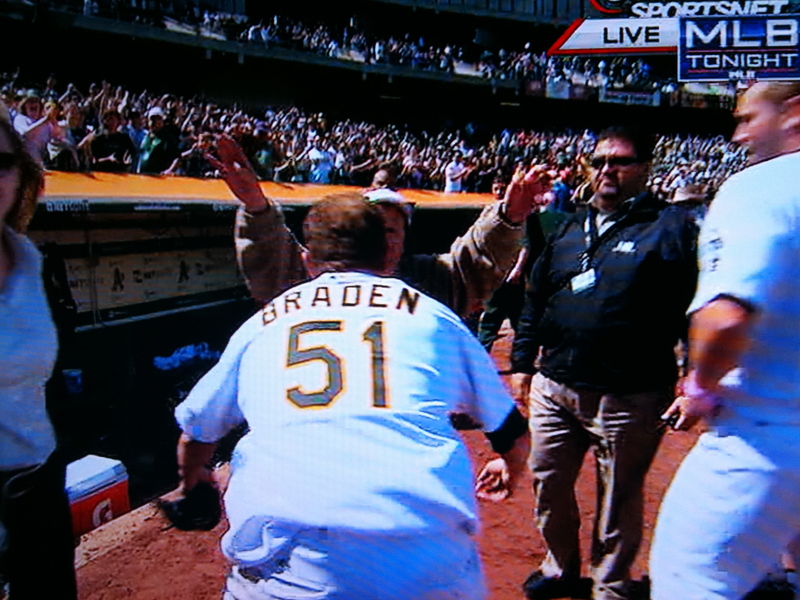 I have to agree with Dallas Braden – it was a sign of disrespect, or an attempt at gamesmanship, for Alex Rodriguez to cut back to first across the mound in the afternoon in Oakland. 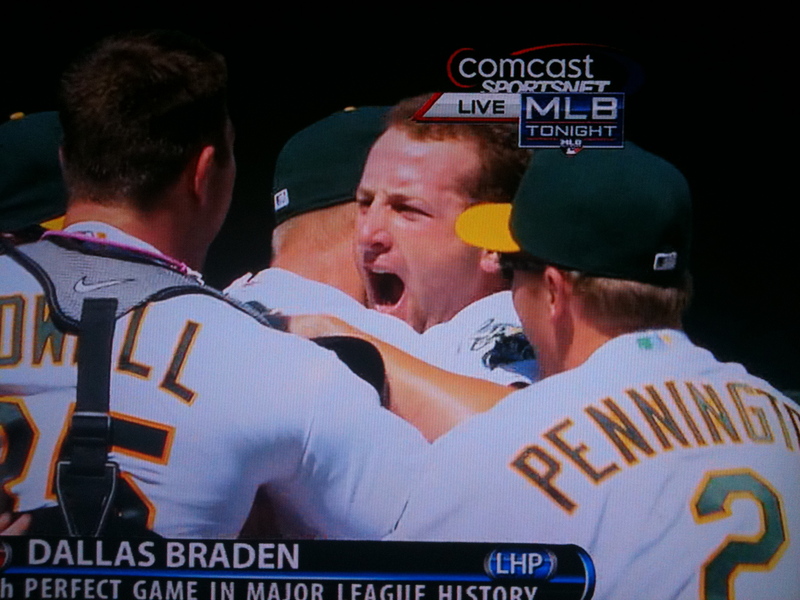 And I have to agree with Rodriguez that Braden’s temper tantrum in the dugout was bush league. And I have to agree with whoever investigates Braden’s comments that they probably already constitute a threat, or certainly something to watch in future meetings. Here in New York the Cubs just completed a somnambulant series loss to the Mets and the listlessness of the team makes one wonder if Lou Piniella has just had enough of his underachieving, poorly-designed team. The irony here is that Cub starting pitching may not have been this good in decades – good enough that I entirely buy the idea of moving Carlos Zambrano to the bullpen, at least unless and until Carlos Silva or Tom Gorzelanny collapses. But Piniella’s ennui and the unlikely fact that two other big league skippers are already official lame ducks has made me think, and put out a few calls, about who would be the likeliest successor to each of the current 30 big league skippers. There are some interesting facts to consider: none of the current managers were promoted to the big league job from having been manager of the team’s AAA affiliate, and only six (Gardenhire, Geren, Jerry Manuel, Riggleman, Trembley, Tracy) were promoted from their own team’s coaching staff (although Cox, Gaston, Girardi, Hinch, and Charlie Manuel were working in their organizations in other jobs when they became the boss). ARIZONA: No clue and given the last hire, it could come from almost anywhere. ATLANTA: Maybe Chico Cadahia or Eddie Perez, but I think the best bets are two former Cox lieutenants, Fredi Gonzalez of the Marlins, and ex-Brewers boss Ned Yost. If the latter were the obvious choice, he’d probably be back on the staff, not an advisor in KC. CHICAGO: It’s Ryne Sandberg. If Lou walked away suddenly there’d be a good chance Alan Trammell would be an acting skipper, but in any kind of orderly transition, it’s Sandberg. CINCINNATI: No obvious candidate. Possibly Mark Berry – it would be nice to see AAA skipper Rick Sweet given first shot, but he may be a victim of his own development ability. FLORIDA: It would be Carlos Tosca short term, but the Marlins would probably like a name if they made a change. HOUSTON: Very unlikely that any change would take place. Dave Clark would probably get another chance if Brad Mills runs screaming into the street. LOS ANGELES: Mattingly. How odd will that look? MILWAUKEE: It was a surprise that given how well Dale Sveum handled what could have been a sinking ship, coming in weeks before the playoffs in 2008, that he didn’t keep the job. Even now when Ken Macha goes, it could easily be not Sveum but Willie Randolph. NEW YORK: Bob Melvin, Major League Scout. His managerial track record is pretty good. Ironically, the man for whom he took over in Arizona after the briefest off-season tenure in managerial history, Wally Backman, is the top minor league possibility. PITTSBURGH: They like Carlos Garcia. How much, I don’t know. The Bucs (despite the 20-0 loss) have a serious conviction they are breaking through under John Russell. SAN FRANCISCO: No clue. Last internal hire was Dusty Baker. ST. LOUIS: Jose Oquendo, unless somebody else has grabbed him first. WASHINGTON: Pat Listach. That may not be soon, but that may be the plan.